Haycock, Ronald G.. "Sir Samuel Hughes". The Canadian Encyclopedia, 21 February 2017, Historica Canada. https://www.thecanadianencyclopedia.ca/en/article/sir-samuel-hughes. Accessed 20 April 2019. Sir Samuel Hughes, teacher, journalist, soldier, politician (born at Darlington, Canada W 8 Jan 1853; died at Lindsay, Ont 24 Aug 1921). A Conservative and an enthusiastic supporter of Sir John A. Macdonald's National Policy, Sam Hughes was elected to Parliament for Victoria North in 1892. 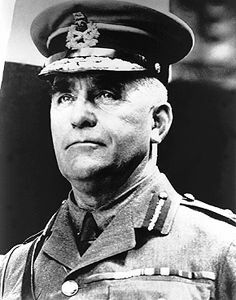 Hughes promised to be the genius of the war effort but his erratic career ended in incompetence and scandal (courtesy Library and Archives Canada/C-20240). 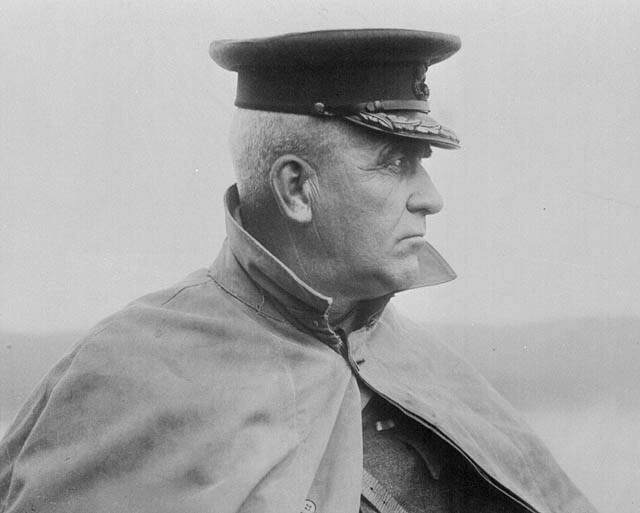 General Sir Samuel Hughes watching the departure of the Canadian Expeditionary Force, 1914. Image: Library and Archives Canada/C-002468. Sir Samuel Hughes, teacher, journalist, soldier, politician (born at Darlington, Canada W 8 Jan 1853; died at Lindsay, Ont 24 Aug 1921). A Conservative and an enthusiastic supporter of Sir John A. Macdonald's National Policy, Sam Hughes was elected to Parliament for Victoria North in 1892. Vain, colourful, charming and splenetic, Hughes made a 30-year public career of politics and militia service. A longtime proponent of the volunteer militia and the imperial connection, he helped force Prime Minister Laurier to send Canadian troops to the South African War in 1899. 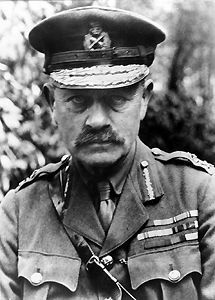 Hughes was dismissed from that war for military indiscipline and public exposure of incompetent British generalship. These experiences produced a Canadian nationalist slant to Hughes's imperialist leanings. By 1911, with years of solid caucus and parliamentary service - including 10 years as Opposition militia critic - and personal loyalty to R.L Borden behind him, Hughes won the militia portfolio in Borden's new government. Hughes promoted citizen-soldiers over professionals (to the latter's detriment), and preached the social value of military training and national preparedness. Early in WWI, Hughes was hailed as the genius of the war effort. Unfortunately, favouritism, confused civil-military functions, disrespect of Cabinet, administrative incompetence and scandals such as the Ross Rifle fiasco (see Armaments) forced Borden to fire Hughes in November 1916. He died in 1921, a reluctant and sometimes bitter Conservative-Unionist MP for Victoria-Haliburton. Although Hughes was a sincere Canadian and a successful constituency politician, his erratic talents never matched the demands of high office during total war. R.G. Haycock, Sam Hughes: The Public Career of a Controversial Canadian 1885-1916 (1987). First World War (1914 – 1918)Extensive online resources about Canada's military role in the First World War from Veterans Affairs Canada. Sir Samuel HughesA biography of Sir Samuel Hughes, teacher, militia officer, newspaper proprietor, and politician. From the Dictionary of Canadian Biography Online. The Blind Leading the BlindTim Cook’s detailed article about the disastrous Battle of St. Eloi. From the journal Canadian Military History. MEASURING THE SUCCESS OF CANADA'S WARS: THE HUNDRED DAYS OFFENSIVE AS A CASE STUDYA multilevel assessment of the Canadian Forces’ much vaunted “Hundred Days Offensive” in the final months of the First World War. From the Canadian Military Journal.